A vertical of Giacomo Conterno is a prime piece of classic Barolo-ology to get the teeth into… to uncover the mystery of Monfortino Barolo. Turning up on a sunny Spring morning at the Corney & Barrow offices near the Tower of London, around the same time as Antonio Galloni was in town for his Giacomo Conterno dinner (and I, without a spare £1500 for a ticket) this was a dreamlike vertical. Sadly I arrived too early to meet Roberto Conterno. If I had met him, I had a lot to ask, especially about some of the ideas his father had about style and also some facts that seem to be different everywhere I search. Giovanni was quite demanding from all accounts – many vintages, which were good enough for most, were not deemed good enough to carry the label of Conterno and sold sfuso. The aromas produced by these wines, especially Monfortino, are understated and robust and the younger vintages flicker with seduction. They draw the taster in with elegant and classic flavours only to hint at darkness and depth underneath. 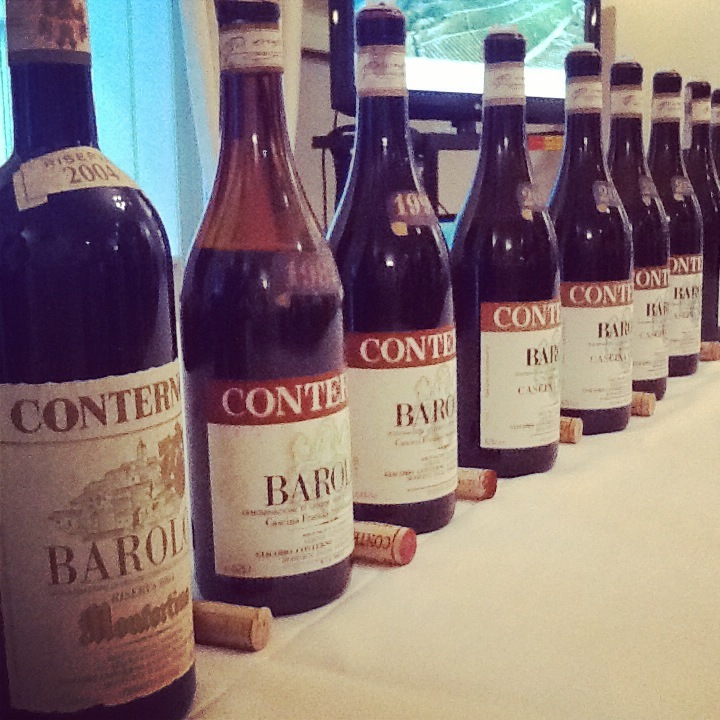 The 1990 is an amazing experience and where Giacomo Conterno (and great Barolo) really hits its stride. The line up: a Barbera Cerretta 2008, three Barbera Cascina Francia (2008, 2011, 2007), seven Barolo Cascina Francia (2009, 2008, 2007, 2006, 2005, 1990, 1982) and finishing with the sublime 2004 Monfortino. Hold on to your hats, Monfortino is one of the most important Barolo out there yet so often I see misinformation. Giacomo Conterno bought the Cascina Francia vineyard in Serralunga d’Alba vineyard in 1974. Roberto’s father, Giovanni, made his first Barolo in 1959 with his father consulting. According to records from Giacomo’s sons, the first Monfortino was produced prior to the First World War. So, what is “Monfortino” if it is not named after one single vineyard? Galloni’s dinner goes back to 1970 and sometimes I see dinners that go back to the 1940s. The spectacular Monfortino is only made in the best vintages, it is not the selection of the best grapes from the Cascina Francia vineyard. It is not the second wine. The biggest difference between Monfortino and the Barolo reserva is the fermentation and aging. Monfortino is fermented and aged for longer than the Barolo Reserva and can be in barrel for ten years or so before it is released. No one said Barolo is easy. Therein the beauty lies. This long aging means something important for Barolo collectors: they can be fragile wines and must be properly handled and stored over many decades to get the best out of them. Provenance is important for bottle variation. And the 2004 Monfortino? Exquisitely constructed with mesmerizing texture and red fruit and to have time to let the aromas breathe and develop… and this lingering melody carried me all the way back to London Bridge. For notes on the vertical (and one who knows the mystery of Monfortin), see Duvault Blochet. Next PostWhat drives a Wine Collector?